It is increasingly likely that the Eurozone could become the Humpty Dumpty of currency unions. If so, this is a tragedy foretold by many observers. Martin Feldstein, for example, argued back in the late 1990s that there were too many cultural, institutional, and economic differences in the EU nations for a single currency to work. He even claimed that the currency union could lead to more conflict instead of reducing it as many Euro supporters claimed it would do. His skepticism of the Eurozone was shared by many others, particularly American economists, who saw a one-size-fits all monetary policy as destabilizing to the regional economies in the EU. For all these naysayers, though, there were supporters who argued that political gains will trump any economic costs in the monetary union and that over time many, if not most, of these costs would disappear as the regional EU economies converged. 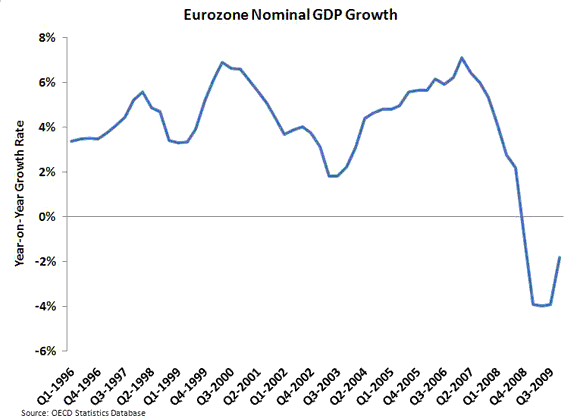 Well so much for the Euro optimists. Many folks are now saying that at a minimum there needs to be a “shock and awe” bailout package as high as $1 trillion to keep Eurozone intact. Yikes. (2) Don’t hang your hope on becoming a successful currency union by meeting the OCA criteria ex-post. Some observers argued around the time of the Eurozone’s inception that looking at the OCA criteria ex-ante was not warranted since the criteria themselves would emerge once a currency union was formed. This “endogenous” view of the OCA gave hope to the Euro optimists and lent support to their cause. Now there is evidence that joining a currency union does stimulate trade as transactions costs are lowered. One study found currency unions more than tripled trade among members. It is apparent now, though, that some of the Eurozone periphery did not integrate enough to justify the cost of being a member in the currency union. It is best not to base the survival of a currency union on hope. 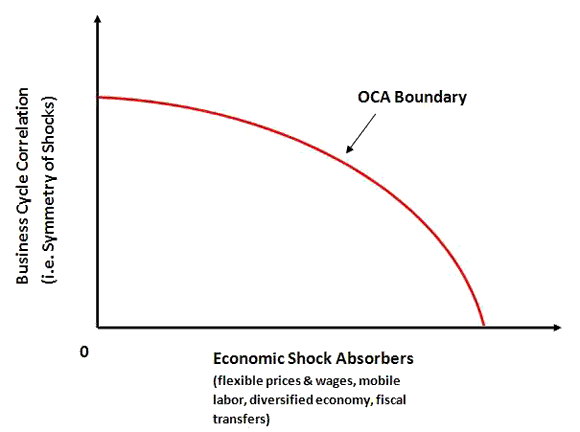 As an aside, it is worth nothing that even if a region does endogenously meet the OCA criteria further problems can arise from being a part of the currency union. The increased trade flows and economic activity within the currency union can over time lead to regional specialization that makes the regions more susceptible to economic shocks. Paul Krugman first made this point in 1998 and the idea has become known as the “Krugman Specialization Hypothesis” (KSH). I think the best example of KSH is the United States. Despite being a currency union for many years, the United States did not become an OCA until the 1930s according to Hugh Rockoff. One reason is because there was so much regional specialization and until the New Deal reforms, many of the economic shock absorbers necessary to offset the lack of regional economic diversification were simply missing. So even if the Eurozone were a functioning OCA there is no guarantee it would stay that way. (3) Take the real exchange rate seriously. A summary measure of a country’s external competitiveness is its real exchange rate. If a country’s real exchange rate is appreciating then its goods are becoming more expensive to the rest of the world. And, as a result, it will begin losing foreign earnings and the ability to meet external obligations. In a time of crisis for a country dependent on foreign funding this problem becomes more pronounced. As seen in the next figure, most of the Eurozone periphery has had a real appreciation on average since the inception of the Euro! According to this measure, monetary policy in the Eurozone has been rather tight over the last year. 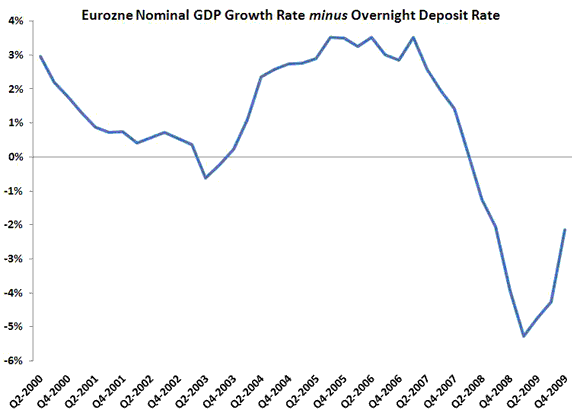 The Eurozone’s future would have been more secure had the ECB been more vigilant in stabilizing aggregate demand. Why Europe Matters to the U.S.